Pitot pressure, or impact air pressure, is sensed through an open-end tube pointed directly into the relative wind flowing around the aircraft. The pitot tube connects to the ASI or an air data computer depending on your aircraft’s configuration. Static pressure is also used by the ASI as well as the other pitot static instruments for determining altitude and vertical speed. Static pressure may be sensed at one or more locations on an aircraft. Some may be flush mounted on the fuselage or integrated into the electrically heated pitot tube. [Figure 5-1] These ports are in locations proven by flight tests to be in undisturbed air, and they may be paired, one on either side of the aircraft. This dual location prevents lateral movement of the aircraft from giving erroneous static pressure indications. The areas around the static ports may be heated with electric heater elements to prevent ice forming over the port and blocking the entry of the static air. Figure 5-2. 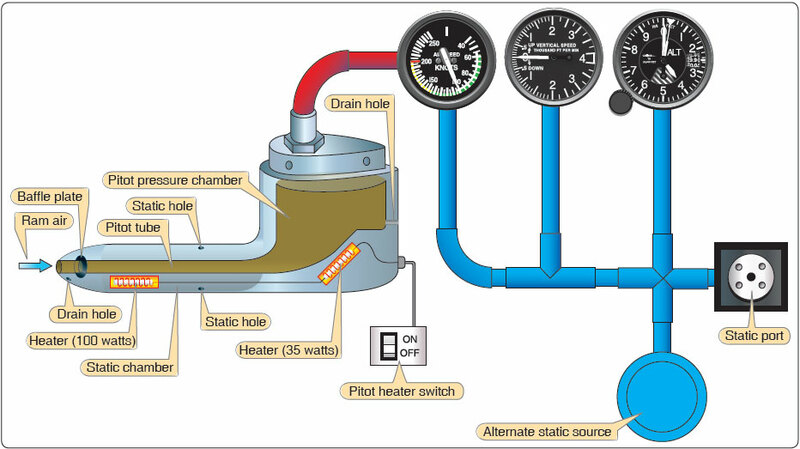 A typical pitot-static system. Errors in the ASI and VSI almost always indicate a blockage of the pitot tube, the static port(s), or both. Moisture (including ice), dirt, or even insects can cause a blockage in both systems. During preflight, it is very important to make sure the pitot tube cover is removed and that static port openings are checked for blockage and damage. If the pitot tube drain hole becomes obstructed, the pitot system can become partially or completely blocked. When dynamic pressure cannot enter the pitot tube opening, the ASI no longer operates. If the drain hole is open, static pressure equalizes on both sides of the diaphram in the ASI and the indicated airspeed slowly drops to zero. If the pitot tube ram pressure hole and drain hole become obstructed, the ASI operates like an altimeter as the aircraft climbs and descends. Refer to the Pilot’s Handbook of Aeronautical Knowledge (FAA-H-8083-25A) for more in depth information on blocked pitot systems along with different scenarios and how they effect the ASI. When a static system becomes blocked but the pitot tube remains clear the ASI continues to operate but is inaccurate. When the aircraft is operated above the altitude where the static ports became blocked the airspeed indicates lower than the actual airspeed because the trapped static pressure is higher than normal for that altitude. The opposite holds true for operations at lower altitudes; a faster than actual airspeed is displayed due to the relatively low static pressure trapped in the system. 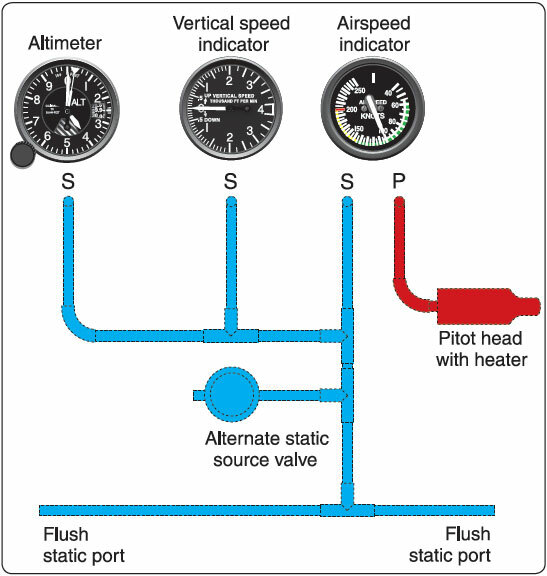 A blockage of the static system can also affect the altimeter and VSI. Trapped static pressure causes the altimeter to freeze at the altitude where the blockage occurred. In the case of the VSI, a blocked static system produces a continuous zero indication. An alternate static source is provided in some aircraft to provide static pressure should the primary static source become blocked. The alternate static source is normally found inside of the flight deck. Due to the venturi effect of the air flowing around the fuselage, the air pressure inside the flight deck is lower than the exterior pressure. For more information on static system blockages and how to best react to such situations, refer to the Aeronautical Knowledge Section. The static ports are located in a position where the air at their surface is as undisturbed as possible. But under some flight conditions, particularly at a high angle of attack with the landing gear and flaps down, the air around the static port may be disturbed to the extent that it can cause an error in the indication of the altimeter and ASI. Because of the importance of accuracy in these instruments, part of the certification tests for an aircraft is a check of position error in the static system. The Pilot’s Operating Handbook (POH)/Aircraft Flight Manual (AFM) contains any corrections that must be applied to the airspeed for the various configurations of flaps and landing gear.